The online world has certainly been great for marketers. There’s a wide variety of platforms in which numerous forms of marketing can take place on the web, with sites such as Facebook, LinkedIn and Twitter the most popular places for those marketers to go. While using these online platforms there are still many offline platforms being used to market to customers as well, including TV and radio ads, billboards, email and mobile phones and devices. Text marketing is one of the most popular ways of marketing offline. While it has been around for 20 years already, it has been recent years that have seen the influx in popularity of text marketing. Whether a small or large business it can help take your brand to the top. Although email marketing was very popular for a brief period of time, it quickly turned ugly when it was used more for spam than for actual offers that would be of interest to an individual. These days it is messages found inside of spam folders and those that are deleted without ever being opened. Email marketers themselves are even turning to new and improved methods of reaching out to consumers, and thus SMS popularity has arose. Up to 5 billion people use text messaging across the world, and they wouldn’t have it any other way. It is fast, trusted and efficient. Global brands often have more difficulty reaching a large customer base than those found within the states. They are finding that mobile marketing enables them to easily bring more awareness to their brand in the US, and other countries as well. Text marketing is truly universal. Text messaging is the perfect way to reach out and touch a customer no matter where they are at in the world. If you send the customer a meaning message via their mobile decide you can gain their trust, their loyalty and their dollars on your products. One fact supports this: Juniper Research intends to increase mobile couponing by 8% by the year 2016. 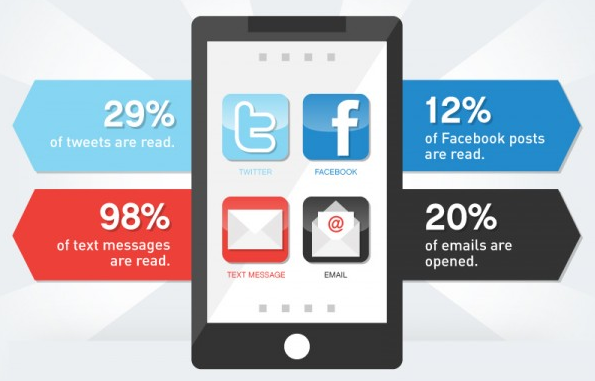 This is another reason that more businesses want to add text marketing to their advertising platform. Text message marketing builds more customers, more loyal customers, and it is also a great way for marketers to measure the results and hone in on them to make them even more valuable in the end. The ability to know whether the message has been read, opened and redeemed is one of the tools Text message marketing offers. Tools that evaluate the effectiveness of the campaign are also easily accessible to markets using this method of marketing. And, since customers are in control with the ability to opt-in or out any time they want, it is an awesome way to gain their trust. A successful mobile marketing campaign is not given. There are, however, numerous things that can be done to ensure that you do have a campaign that gets the results you were expecting and more. Take a look. Text marketing should not be used alone. It should be used in conjunction with other advertising platforms to make it work. This includes social media and email. Use text to your advantage by thinking outside of the box. Sure, customers want the coupons, but there are many other ways that mobile marketing can be used, and anything creative the customer will appreciate. The ROI is amazing with text marketing. And, thanks to the ability to target and measure results marketers have the chance to increase their messages to cater more personally to the individual who will be receiving the message. Make sure that you are using the measurements in this fashion and you will enhance the vision of your business.